The Vancouver Whitecaps are no longer pointless. 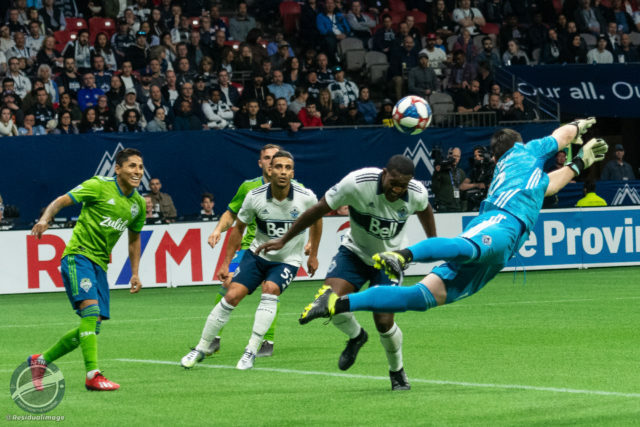 The ‘Caps got their 2019 season off and running at the fourth attempt on Saturday evening, earning a hard fought point in a goalless draw at home to the still unbeaten Seattle Sounders at BC Place. It wasn’t a classic Cascadia Cup encounter by any means, but for the Whitecaps it was a performance that showed signs of steadying the ship and was built upon an extremely resolute defensive display. After three straight one goal losses, Marc Dos Santos’ new look Whitecaps side got their first point of the campaign, taking a massive weight off everyone’s shoulders and giving some hope of what this Vancouver team will be capable of producing once they fully hit their stride. Dos Santos has always had faith that the ‘Caps weren’t too far away from starting to turn things around, but admitted that getting this particular points monkey off his back did bring something of a relief to the team. “It’s always a relief to break the ice because you don’t want pressure to accumulate too much,” Dos Santos admitted after the match. “I always had a sense of belief and I said it many times. If you look at results in MLS, you see games of 3-0, 4-0, 5-0 and you see in the three losses that we had, it’s always little details. Like little things. While Dos Santos felt that his team could have created more opportunities, he saw the result and the performance as “a step forward”. A prime reason for that was that solid defensive shift put in by his side. The Whitecaps had given up seven goals in their first three matches of the season, but they not only kept Seattle off the scoreboard in this one, they held a Sounders side that had already racked up ten goals this year to just three shots on target and negated the danger of Jordan Morris and Raul Ruidiaz, neither of whom got a shot on goal. There were some standout performances on the backline, but the centre back pairing of Doneil Henry and Erik Godoy particularly stood out and are starting to show a great understanding together back there. “I work with them everyday, I believe in them,” Dos Santos stated. “Doneil has shown signs all year of great defensive plays. Sometimes, and he knows that, he can get lazy with the ball, but he didn’t do that today. He’s grown. If you see Érik training sometimes, you think it’s too easy for him. Adnan looked impressive on his debut. A true left back and already looking one of the most quality defenders added to the Whitecaps in their MLS era. That position should now be his until his loan deal finishes at the end of June, finally giving some stability to the left side of the ‘Caps defence. 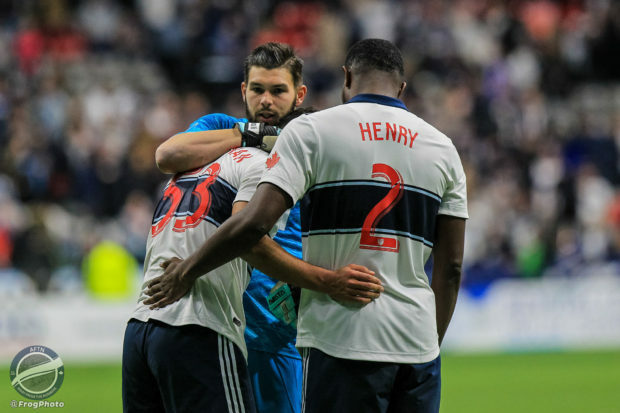 But despite the ever changing left back position, the Whitecaps defence has been fairly stable, and that’s what Henry attributes to things starting to look a lot better back there. It’s only one game, but there was enough on show to give some optimism moving forward. 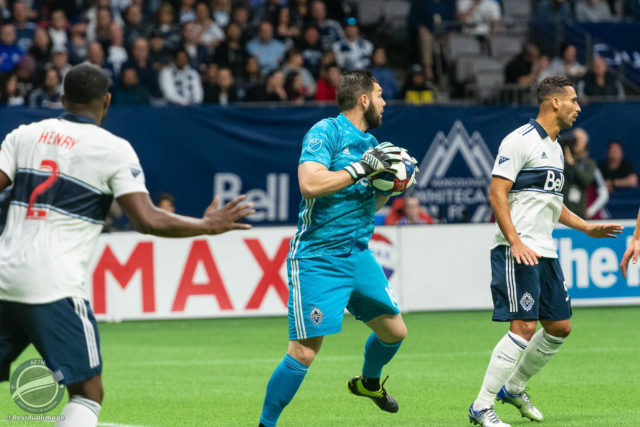 They were under the cosh at times, and held firm throughout, giving the Whitecaps their first clean sheet in MLS since April 27th last season and the 2-0 home win over Real Salt Lake. “As a defender, we get put in tough situations all the time,” Henry added. “We’re the villains when we get scored on, and we don’t get the praise when we win. Of course as a defender, we really look forward to getting clean sheets. But we go in every day at training and we try to perfect our craft. Clean sheets were proving rarer for the Whitecaps than the laundry room of an old folks home, but Max Crepeau was the man standing tall come the end of the 90 minutes, recording his first ever shutout in MLS. Last year’s USL goalkeeper of the year felt the team can definitely take some pride for how they defended against Seattle, but promised that this is just the start of a defensive turnaround for the team and that there’s a lot more to come. “It feels good but it’s just the beginning,” Crepeau said. “Going to USL last year was great for me personally as a goalkeeper, getting the games was fantastic, and I grew from there. In MLS now, it’s about getting some momentum, getting the clean sheets if we can get clean sheets.